I have puppies available!!! There are 2 puppies still available. All puppies are sold with spay/neuter contracts and come with a 1 year health guarantee. The contract must be read on this website on the contract page so you will understand what it entails and what you will have to sign the day you pick up the puppy. I prefer that you read it before placing a deposit on a puppy since you must agree to abide what is in the contract. All the puppies will come with their first shots which they will receive at 6-7 weeks of age and also weekly wormings starting a two weeks old until they are 8 weeks old. The puppies will be on Royal Canin x-small mini puppy food the dry kibble and the canned wet food. The puppies will take home a puppy food kit which contains a small bag of the dry kibble, one can of the wet food, a measuring cup and a coupon for a free bag of dry food which is available at Pet Smart or through the Royal Canin website (which is cheaper through the website). The puppies also take home a blanket with their mom and siblings scent on it, a folder with their shot and worming record, their contract, other paperwork, a magnet and my card. They also take home a couple toys, a couple puppy pads, a bag of treats, and a collar to wear home. So they are all set and have everything they need when they first go home. The puppies are bathed, brushed, have their ears cleaned and their nails cut before they leave. The puppies need to have a vet appointment scheduled within 3 business days after they leave me for their 1 year health guarantee to be in effect. So if you get a puppy its best to make their vet appointment two weeks prior to the puppy's pick up date if possible. The available puppies and their pictures are below. For more info or questions you can text me with your name at 302-561-4803 or email me at kmber1966@verizon.net or use the contact form on this website to contact me also. This is Puppy #1 from Lacey and Chips litter. 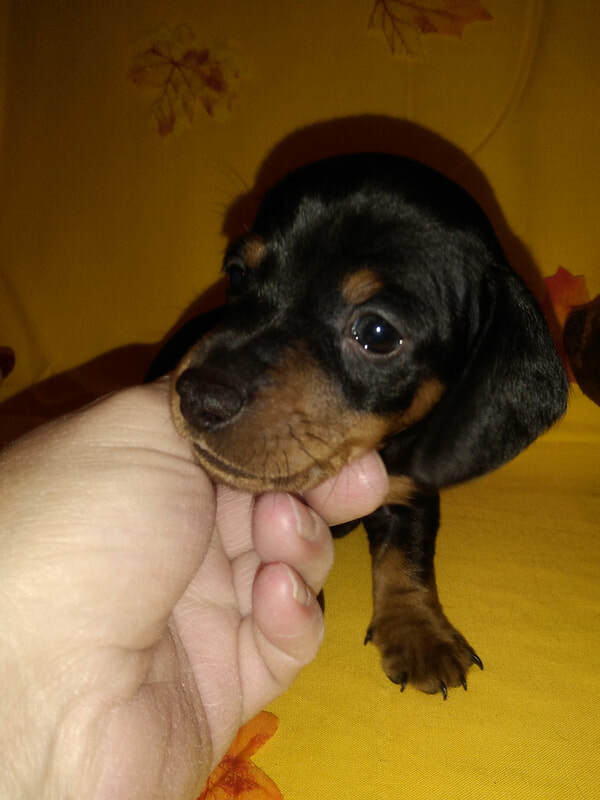 He is a smooth coat, black & tan silver dapple male. He was born on March 1st 2019. He will be ready to go at 8 weeks old on April 26th. He will be sold with a neuter contract. This little guy is very sweet and affectionate. He is very playful and just loves to play. He has a very loving & friendly disposition. He has a great temperament and is laid back. He loves to have his belly rubbed, he loves to cuddle and he gives me kisses all the time. He will be around 11-13 lbs as an adult. He is a very sweet and happy puppy. This little dapple boy is 1,250.00. A deposit of 200.00 will hold him until he is ready to go on April 26th 2019. If you're interested in this little guy please text me at 302-561-4803 or email me at kmber1966@verizon.net. You can also use the contact form on this website to contact me. The puppies can have visits when they reach 5 weeks old unless I feel they are not ready yet. Below is puppy #2 from Chloe and Chip's litter. She is a smooth coat solid dark red female. She was born on March 11th 2019. She will be ready to go on May 4-5th 2019. She will be sold with a spay contract. Her eyes just opened a week ago so she still isnt doing much yet but eating and sleeping and looking around at her environment, me, her siblings and mom. So she isnt showing her personality quite yet. But all my puppies are very sweet with great temperaments and loving dispositions. They are laid back, friendly and playful just like their parents. She will be about 10-12 lbs as an adult. She is 975.00 and a 200.00 deposit will hold her until she is ready to go. If you're interested in this little red beauty please text me at 302-561-4803, or email me at kmber1966@verizon.net. You can also contact me through the contact form on this website.